Planning to set up a Gym at home? 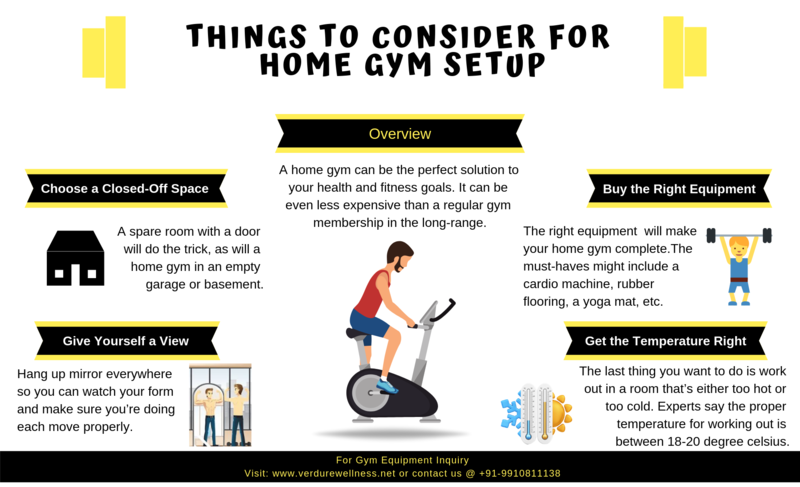 Verdure Wellness has created this infographic to guide you on the things which you must consider for setting up a home gym. Finalize the space for home gym setup. It can be a room with proper air circulation, garage or basement. Buy the right equipment. Research for read reviews for best gym equipment provider Company. You can buy gym equipment online. Install mirrors to give yourself a view. Mirrors are helpful to watch your each move. Checkout the temperature of the room, ideal temperature for working out is 18-20 degree Celsius. Previous post: The Ultimate Guide to install a Jacuzzi tub in HomeNext post : What are the Different Types of Swimming Pools?